He threw a pair of touchdown passes to Robert Prescott and Jake Cookus (currently an assistant for the Beavers) pulled down three of Oregon State’s five interceptions. The Beavers went on to win 23-13, reaching 10 wins for the first time in school history, then played in the Fiesta Bowl against Notre Dame. The Ducks finished 9-2 and played in the Holiday Bowl. “When you go 10-1 at a school that has never been 10-1, and was at rock bottom a few years ago, it doesn’t get any better than that,” Beavers coach Dennis Erickson said afterward. The stakes are nowhere near as high in the 122nd Civil War. The Beavers (2-9, 1-7 Pac-12) are essentially playing for bragging rights in Smith’s first season as head coach in Corvallis. The Ducks (7-4, 4-4) are looking to improve their bowl prospects. First-year Ducks coach Mario Cristobal said emphasizing the postseason implications is just part of the team’s preparation. HERBERT’S LAST? 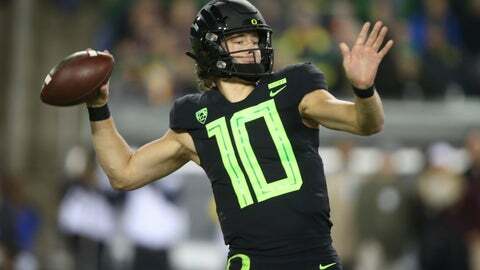 Oregon quarterback Justin Herbert may or may not be playing in his final Civil War. Herbert is widely considered one of the top prospects at his position should he decide to skip his final year of eligibility and declare for the NFL draft. If he stays in Eugene, he’ll get a chance to play with brother Patrick, a four-star tight end who has committed to the Ducks. LUTON’S LAST? The Civil War could cap quarterback Jake Luton’s tenure at Oregon State, which has been marked by injuries. Last season he suffered a thoracic spine fracture against Washington State. This year he had a concussion and a high ankle sprain that kept him out of four games. Smith said there’s a possibility that Luton could petition for a medical hardship waiver for a sixth year of eligibility. Luton told The Oregonian this week that he’d be open to returning for another season. MITCHELL HISTORY: Oregon wide receiver Dillon Mitchell has 68 catches for 1,105 yards and nine touchdowns this season. He ranks atop the Pac-12 for receiving yards and is ninth in the nation with an average of 100.2 per game. He needs just 36 yards to break Josh Huff’s single-season school record for receiving yards. “Obviously the back has garnered a lot of attention, and rightfully so, as a freshman he’s widely considered one of the best freshmen in the country. The offensive line has done a tremendous job for him,” Cristobal said in assessing the Beavers’ offense.